There is no doubt a Japanese restaurant is good when you see actual Japanese people dining in it. Lucky for my partner and i, we were seated beside a regular customer, who kindly gave us pointers to what was good on the menu, and was also nice enough to offer us champagne. The restaurant offers seats at the sushi bar, tables, as well as a private room if you have more people and want space to yourselves. It was a pity i didn't get to meet Executive Chef Lawrence, but we were attended to by Chef Daniel, who was kind enough to not over-promise us before the meal about expectations. In the end, both my partner and me still enjoyed the meal thoroughly. "Omakase" is a form of dining when guests entrust the selection and assembly of their meal entirely to the chef - which was exactly what we did. Appetizers are essential when it comes to Japanese cuisine, and at Hinoki, things are a bit different from your normal Japanese restaurants. We were served Cod Sperm in Citrus Sauce, as well as the Angler Fish Liver. Unique (and gross some may say) as it sounds, but it paired off pretty well. The Cod Sperm had a thick like texture to it, and tasted a bit like egg yolk as soon as it hit my tongue. The Angler Fish Liver on the other hand, tasted like pâté. Both are rather acquired tasting so it's either a hit or a miss. The Aji (Horse Mackerel) with ginger and spring onion was slightly easier on the palate. The fish was fresh, thinly sliced, and tasted a bit like the chinese yu sheng (raw fish). I however felt that the ginger took over the whole dish and did not allow the freshness of the fish to come out naturally, which i thought should have been the case. It was recommended to add some shoyu into it, which i preferred. I am a huge fan of sashimi, and am very particular about the freshness of it whenever i dine at Japanese restaurants. As i mentioned earlier, the whole menu was decided by Chef Daniel, hence i left it in good hands. And yes, i can assure you that the sashimi being served at Hinoki is indeed fresh. In fact, if there was a word i could use that could represent "more than fresh", i would gladly use it. The Hamachi (Yellowtail) and Kajiki (Swordfish), which was a bit charred and gave off a smoky flavor, was my favorite. Of course, the others such as the Hotate (Scallop), Sake (Salmon) also impressed me - nothing can go wrong with fresh sashimi and professional chefs. Moving on to the hot dishes from the kitchen, the Swordfish Steak with Special Sauce was beyond impressive. I made myself sound stupid by asking if the sauce was terriyaki, only to be told it was apple and other ingredients used to create it. The swordfish was topped with fish roe and flower petals (that are totally edible), and served along with dried baby sardine, which gave the dish a good texture. One of the dishes that didn't really leave an impression was the Asari (Short Neck Clam) with Asparagus, Seaweed and Onion. My partner however, liked it very much, so much to the extent i offered my portion because i wasn't really enjoying it, except that the broth served with it was flavorful and sweet. Gladly, the asparagus was not overcooked, which i felt was very crucial since there was little on the plate (clams and asparagus), but i feel this dish could do with a miss if you have limited space in your stomach. The Lamb Rack however, was a complete opposite of the previous dish. I liked this dish a lot, while my partner didn't. The lamb was cooked almost perfectly, with no seasoning at all, except the natural flavors from the lamb itself. Served with a drizzle of mustard sauce, i found myself enjoying the tenderness of the lamb with its natural juices, and as soon as it finished mine, i jumped for the other. Point to note at Hinoki, if you do not eat a certain kind of meat, you can inform the chef so he can make amendments to suit your palate. The regular customer seated beside us raved so much about Chawanmushi with Truffle Oil, we decided to give it a go as well. The egg custard was very smooth and silky, and the truffle oil did justice to the dish. Topped with shrimp, ginko nut and shimeiji mushrooms, i found myself enjoying the first few spoonfulls but struggling towards the end. It was either because we were halfway through the meal and i was semi-full, or that it is true that too much of something good isn't exactly a good thing. I recommend this to share if you are going with a partner. I am taken aback at how they managed to do Kajiki (Swordfish) in so many different ways at Hinoki. First it was sashimi, then the steak, and then in beancurd sauce. The Kajiki (Swordfish) in Beancurd Sauce was particularly different from the rest. The sauce was sourish like vinegar and it had a chewy texture to it, instead of the sashimi that melts in your mouth, and swordfish steak with sauce that came off savory. Sushi at Hinoki is a must, and the ones i liked best were the ones that were torched before being served - the Tai (Snapper), Hotate (Scallop) with Mentai (Spicy Cod Roe), as well as the Foie Gras (Goose Liver) with Ebi (Sweet Shrimp). People will think i am exaggerating but they literally melt in your mouth because of all the natural oil after being torched. There is really nothing else to describe it except that it melts in your mouth - simple and straight to the point. I really enjoyed the rest of the sushi as well, including the Anago (Sea Eel) with Citrus Shavings, which is different from Unagi, and less fishier. 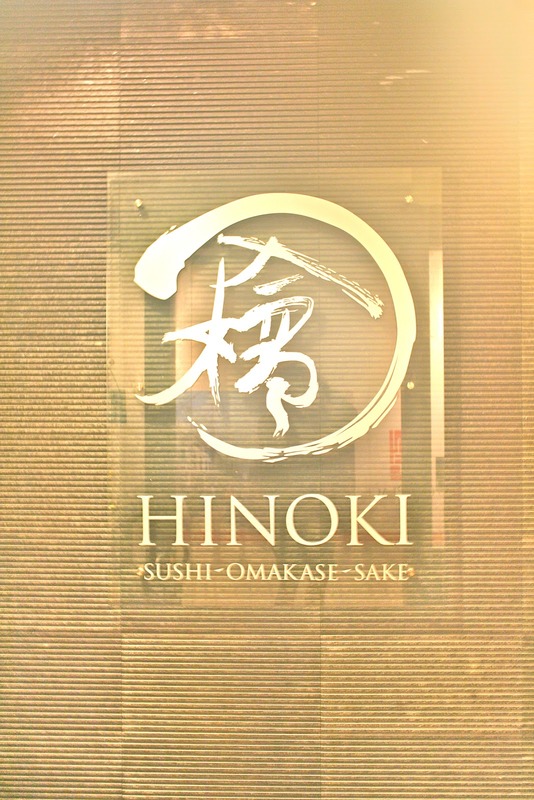 Most sushi at Hinoki already have sauce on it (done by the chef), so unless it is recommended you have it with shoyu, most sushi should be eaten as they are presented. We were surprised when they served us Tuna Consomme in a shot glass, which is tuna and vegetables boiled to make a soup full of goodness. The soup was clear and the natural flavors of the vegetables were present (i am guessing radish due to its subtle sweetness). Good restaurants generally serve you dessert before you leave and the Yuzu Sorbet (from Japan) accompanied by fresh fruits was a refreshing end to the meal. 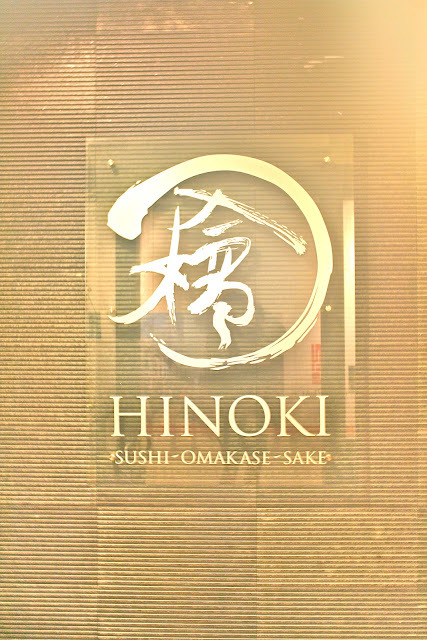 Although prices may be a bit steep at Hinoki, i feel the quality of the food justifies the price point. There are other restaurants i have dined in with standards below par but yet they charge more. If you happen to not want to opt for Omakase, they also serve ala carte dishes on their menu, as well as bento sets. There was nothing to fault with the whole meal we had- the sashimi was fresh, food was presented and service was excellent. Now excuse me as i end this abruptly and make plans for my next visit.